The MBIS Montessori Preschool program is made up of children aged 3-5. Classrooms are specifically designed for the children. The mixed-aged children share the same classroom and learn from each other. Younger children get a chance to look ahead and see what is coming next by watching the older children. 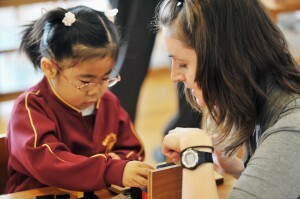 Older children have the opportunity to reinforce their knowledge by sharing it with the younger children. The program gives children the opportunity to explore and discover various areas of the classroom including; practical life, sensorial learning, and mathematics. A strong focus is placed on English language development through phonics, whole language building, and group circle times conducted throughout the day. Children are enriched through science, culture, geography and art activities. They learn to respect others’ work and space, excuse themselves, greet each other, and treat each other fairly. They also take an active role in maintaining their classroom.